Poncho. That’s a funny word. Pon-cho. The shape of this clothing item is funny too, and as you’ve already know, I love all sorts of funny things. As one of my drunk friends once said, 'I feel like wearing poncho, 'cause you never feel sad in it!'. Anyway, I’m glad my Mom got me this poncho as a gift last fall, ‘cause this is an incredibly cozy thing and its colors are perfect for fall. By the way, sorry for my absence. I am a bit ill and weather in here are just crazy, it feels like almost winter, so shooting isn’t really an option. I promise I’ll do a lot more outfit posts and a September favorites very soon. This outfit was taken pictures of quite a while ago and I didn’t actually want to show them to you because of the sucking lighting, but...So ‘yay’ for saving things! You look too pretty wearing that color, GORGEOUS PICTURES ROSA! love the rich hues here. You look gorgeous Rosa...and about that PONCHO...this is an originating garment from my country, Argentina, and was worn by our gauchos, to keep warm! I hope you are having the best weekend, sweetie! I knew that)) Thank you! Wow, what beautyfull look, amazing and lovely poncho and bag. Is bag zara? 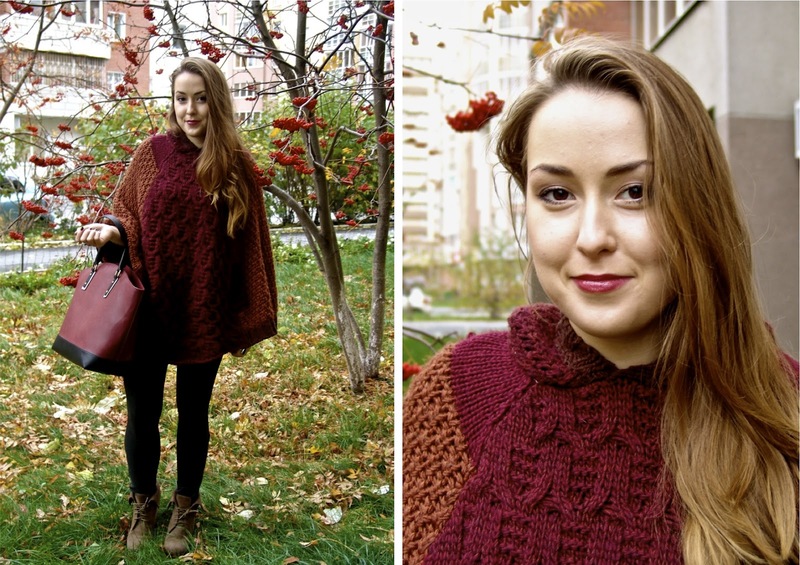 I havn`t seen such color in Moscow, I have that one in brown color. Yes, it's from Zara, new collection. Thank you! цвет божественен! очень тебе идет! I love your look!!! kisses! Цвета!!! Ммм... Суперские! И тебе очень идет! perfect for fall... Love it!